The Welsh Pony and Cob are closely related horse breeds including both pony and cob types, which originated in Wales in the United Kingdom. The breed society for the Welsh breeds has four sections, primarily distinguished by height, but also by variations in type: the Welsh Mountain Pony (Section A), the Welsh Pony (Section B), the Welsh Pony of Cob Type (Section C), and the Welsh Cob (Section D). Welsh ponies and cobs are known for their good temperament, hardiness, and free-moving gaits. Native ponies existed in Wales prior to 1600 BC, and a Welsh-type cob was known as early as the Middle Ages. They were influenced by the Arabian horse, and possibly also by the Thoroughbred and the Hackney horse. In 1901, the first stud book for the Welsh breeds was established in the United Kingdom, and in 1907 another registry was established in the United States. Interest in the breed declined during the Great Depression, but revived in the 1950s.Throughout their history, the Welsh breeds have had many uses, including as a cavalry horse, a pit pony, and as a working animal on farms. Today, the modern Welsh Pony and Cob breeds are used for many equestrian competitive disciplines, including showing, jumping and driving, as well as for pleasure riding, trekking and trail riding The smaller types are popular children’s ponies. The Welsh also crosses well with many other breeds and has influenced the development of many British and American horse and pony breeds. Evidence suggests that a native Welsh-type of pony existed before 1600 BC. The original Welsh Mountain Pony is thought to have evolved from the prehistoric Celtic pony. Welsh ponies were primarily developed in Wales and their ancestors existed in the British Isles prior to the arrival of the Roman Empire. Bands of ponies roamed in a semi-feral state, climbing mountains, leaping ravines, and running over rough moorland terrain. They developed into a hardy breed due to the harsh climate, limited shelter and sparse food sources of their native country. At some point in their development, the Welsh breeds had some Arabian blood added, although this did not take away the physical characteristics that make the breed unique. The Welsh Cob existed as a type as early as the Middle Ages, and mentions of such animals can be found in medieval Welsh literature. During this time period they were known for their speed, jumping ability and carrying capacity. Before the introduction of large, “coldblood” draft horse breeds, they were used for farm work and timbering. In 1485 the Welsh Militia, riding local animals presumed to be ancestors of the modern Welsh Cob, assisted Henry Tudor in gaining the English throne. During the 15th century, similar small horses were also used as rounceys, leading war horses known as destriers. The characteristics of the breeds as they are known today are thought to have been established by the late 15th century, after the Crusaders returned to England with Arabian stallions obtained from the Middle East. In the 16th century, King Henry VIII, thinking to improve the breeds of horses, particularly war horses, ordered the destruction of all stallions under 15 hands and all mares under 13 hands in the Breed of Horses Act 1535. The laws for swingeing culls of ‘under-height’ horses were partially repealed by a decree by Queen Elizabeth I in 1566 on the basis that the poor lands could not support the weight of the horses desired by Henry VIII because of “their rottenness … [they] are not able to breed beare and bring forth such great breeds of stoned horses as by the statute of 32 Henry VIII is expressed, without peril of miring and perishing of them”, and (fortunately for the future of Britain’s mountain and moorland pony breeds) many ponies in their native environments, including the Welsh breeds, therefore escaped the slaughter. On the upland farms of Wales, Welsh ponies and cobs would often have to do everything from ploughing a field to carrying a farmer to market or driving a family to services on Sunday. When coal mining became important to the economy of England, many Welsh ponies were harnessed for use in mines, above and below ground. In the 18th century and 19th century, more Arabian blood was added by stallions who were turned out in the Welsh hills. Other breeds have also been added, including the Thoroughbred, Hackney, Norfolk Roadster, and the Yorkshire Coach Horse. Before the car was developed, the speediest mode of transportation in Wales was the Welsh Cob. Tradesmen, doctors and other businessmen often selected ponies by trotting them the 35 uphill miles from Cardiff to Dowlais. The best ponies could complete this feat in under three hours, never breaking gait. Formal breeding stock licensing was introduced in 1918, but before this, breeding stock was selected by trotting tests like these. In 1901 English and Welsh breeders established a breed registry, called the Welsh Pony and Cob Society, and the first stud book was published in 1902. It was decided that the Welsh Stud Book should be separated into sections divided by type and height. Welsh Ponies were originally only classified as Section A, but in 1931, with the rising demand for riding ponies for children, Section B was added. In the first stud books, the Section B was the Welsh Pony of Cob Type, and the Welsh Cob was Section C and Section D. The upper height limit for Section D Cobs was removed in 1907 and in 1931 Sections C and D were combined as simply Section C. The current standards of Cobs as Sections C and D were finalised in 1949. Until the mid 20th century, the British War Office considered the Welsh Cob so valuable that they paid premiums to the best stallions. After World War II, only three stallions were registered with Section C, but numbers have since recovered. Welsh ponies adapted easily to the terrain and climate variations they encountered when exported to Canada and the United States. They were first exported to the United States as early as the 1880s, and large numbers of animals were exported between 1884 and 1910. The United States registry, also named the Welsh Pony and Cob Society, was incorporated in 1906., and by 1913 a total of 574 ponies had been registered. During the Great Depression, interest in the breed declined, but made a comeback in the 1950s. The population continued to grow, 2,881 ponies had been registered by the end of 1957, and annual studbooks began to be published. All Welsh ponies and cobs in the United States today descend from ponies registered with the UK registry, and over 34,000 have been registered with the US registry as of 2009. 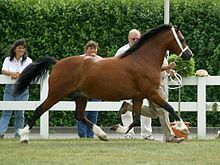 The stallion Dyoll Starlight was credited with being the foundation sire of the modern breed, and was a combination of Welsh and Arab breeding. From his line came an influential stallion of the Section B type: Tan-y-Bwlch Berwyn. This stallion was sired by a Barb and out of a mare from the Dyoll Starlight line. Influential stallions on the Section C and D bloodlines include: Trotting Comet, foaled in 1840 from a long line of trotting horses; True Briton, foaled in 1930, by a trotting sire and out of an Arabian mare; Cymro Llwyd, foaled in 1850, by an Arabian stallion and out of a trotting mare; and Alonzo the Brave, foaled in 1866, tracing his ancestry through the Hackney breed to the Darley Arabian. All sections of Welsh ponies and Welsh cobs have small heads with large eyes, sloped shoulders, short backs and strong hindquarters. The forelegs are straight and the cannon bone short. The tail is high-set. The breed ranges from 11 hands (44 inches, 112 cm) for the smallest ponies to over 16 hands (64 inches, 163 cm) for the tallest cobs. They may be any solid colour, but not piebald, skewbald, (US: pinto) or leopard-spotted. Black, greys, chestnut and bay are the most common, but there are also duns and palominos. However, it should be noted that British equine colour terminology commonly refers to the buckskin colour, which is caused by the same dilution gene that produces palomino, as “dun“, but the true dun gene is extremely rare in the Welsh breed. Their movement is bold and free and characteristically fast, especially at the trot, with great power coming from the hocks. Their trot has been favorably compared to that of the Standardbred horse. They are reputed to be trustworthy, of a good disposition with even temperaments and friendly characters, but spirited and with great endurance, and are known for their stamina, soundness, and high level of intelligence. The Section A Welsh Pony is also known as the Welsh Mountain pony. Both the Section A and Section B ponies are more refined than those in Section C and D. They are characterised from the cob types by a large eye, small head (often with a dished face from the Arabian influence), high set on tail, and refined leg conformation, but retaining good bone and correctness. The Welsh Mountain Pony (Section A) may not exceed 12.2 hands (50 inches, 127 cm) in the US or 12 hands (48 inches, 122 cm) in the United Kingdom. The Welsh Pony of Riding Type (Section B) is the second division within the Welsh pony registry. The Section B Welsh Pony is a larger, riding-type pony. The Section B combines the hardiness and substance of the Section A with elegant movement and athletic ability. Section B ponies are taller than Section A with a maximum height of 13.2 hands (54 inches, 137 cm) in the UK and 14.2 hands (58 inches, 147 cm) in the US They are known for elegant movement and athletic ability while still retaining the substance and hardiness of the foundation stock, the Section A Welsh pony. They have no lower height limit. Section B ponies also generally have a slightly lighter build, as a result of Thoroughbred and Hackney blood. Section B ponies resemble the Section A pony, but are of a more refined “riding type”. However, they should not be light of bone; they should resemble their Mountain Pony ancestors for quality of bone. In addition to the desirable characteristics of the Type A pony, Type B ponies have a free-flowing movement. They should have a muscular neck, arching from withers to poll, and have a deep, wide chest. Section B ponies are more commonly used as children’s ponies and as pony hunter-jumpers. A Section C Welsh Pony of Cob type. The Welsh Pony of Cob Type (Section C) may not exceed 13.2 hands (54 inches, 137 cm) high. They are known for their strength, hardiness and gentle nature. In contrast to the Welsh pony (Section B), it is heavier, more coblike and compact. They have a moderate amount of feathering on their legs. The Welsh Pony of Cob Type first resulted from a crossbreeding between the Welsh mountain pony (Section A) and the Welsh Cob (Section D). Today, some Section C ponies are still produced from this cross. In the past the WPCS also accepted Section C ponies with Section B blood but that is no longer the case. There were also crosses with Iberian horses, which led to the development of the Powys horse, which was also a foundation for this type. Other breeds also influenced the Section C, including the Norfolk Trotter, the Hackney and Yorkshire Coach Horse. The Welsh Pony of Cob Type is shown in jumping events and in harness, notably in competitive driving. A Section D Welsh Cob pulling a carriage. The Welsh Cob (Section D) is the largest size within the Welsh Pony and Cob breed registries. They must be taller than 13.2 hands (54 inches, 137 cm), with no upper height limit. They are used as riding animals for both adults and children, and are also used for driving. They are known for their hardiness and gentle nature. Though they are the tallest and stockiest of the Welsh sections, the head remains full of pony character, with large eyes, and neat ears. The legs may be relatively short, also akin to pony proportions. Mature stallions have somewhat cresty necks, those of mares are generally leaner. Like the section C, they have powerful, extravagant action. Grey colouring is rarer in the section D cob than other types of Welsh ponies, but bold white markings are common. Today, the Section D is best known for use in harness driving, but they are also shown under saddle and in hand. Like other Welsh ponies, Cobs are also exhibited over fences as hunters and jumpers. The Welsh also crosses well with many other breeds and has influenced the Pony of the Americas and the British Riding Pony. Many are also crossbred with Thoroughbreds, and other horse breeds. The Welsh Pony has contributed to the founding of several other horse and pony breeds. The Morgan horse is one such breed, being in part descended from Welsh Cobs left behind by British forces after the end of the Revolutionary War. They are crossed with Arabians to produce riding horses, and with Thoroughbreds to produce jumpers, hunters and eventers. Mares have also been used to breed polo ponies that were agile and nimble. The Welsh Pony was used to create the Welara, a popular crossbreed of the Welsh and the Arabian horse, which created a separate breed registry in America in 1981. 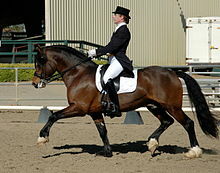 Welsh Cob under saddle – dressage. The Welsh Pony has been put to many uses. Historically, they were used for postal routes and in coal mines. The British War Office used the Welsh Cob to pull heavy guns and equipment through terrain where motorised vehicles could not, and also used them for mounted infantry. Today, they are used as riding and driving ponies for both children and adults. They have proven their ability at driving in Fédération Équestre Internationale (FEI) level competition, and they have been used for dressage. They also compete against one another in breed show competition as hunters, eventers, and western pleasure horses. The abilities of the Welsh pony were showcased in 2008 when the first champion Large Pony Hunter to be made into a model Breyer horse was a grey Welsh pony gelding. In former times many Liverpool docks carthorses were sourced in Wales. A life-sized statue of a Welsh cob stallion, created by sculptor David Mayer, was erected in the town of Aberaeron in 2005, and was donated to the town by the Aberaeron Festival of Welsh Ponies and Cobs to denote the area as Welsh Cob country. A small semi-feral population of about 180 animals roams the Carneddau mountains in Snowdonia, Wales. “Welsh Ponies and Cobs”. Horse Breeds of the World. International Museum of the Horse. Retrieved 2010-12-29. “Welsh Pony and Cob”. Breeds of Livestock. Oklahoma State University. Retrieved 2009-07-01. “OneBreed-Four Sections”. Welsh Pony & Cob Society of America. Retrieved 2009-07-05. “Origins”. United States Equestrian Federation. Retrieved 2009-07-01. Stover, Martha (September 2005). “Welsh Ponies and Cobs”. Equestrian: 92–94. Retrieved 2009-07-05. “Breed information: Section A & B”. The Welsh Pony and Cob Society. Retrieved June 2011. “Welsh Pony”. The Columbia Encyclopedia (6th ed.). 2000. p. 40785. “Characteristics”. United States Equestrian Federation. Retrieved 2009-07-01. “Welara”. Breeds of Livestock. Oklahoma State University. Retrieved 2009-07-05. “First pony hunter “Breyered””. Practical Horseman 36 (11): 68. November 2008. Fallon, Kathleen (26 August 2008). “Newsworthy Becomes First Champion Large Pony Hunter Breyer Portrait Model”. United States Equestrian Federation. Retrieved 19 October 2009. Evans, J. Warren (editor) (1990). The Horse (2nd ed.). New York: Freeman and Company. ISBN 0-7167-1811-1. “The Welsh Pony and Cob Society (United Kingdom)”. “The Welsh Pony and Cob Society of America”. Wikimedia Commons has media related to welsh. Wikimedia Commons has media related to Welsh Pony.